The first Power Shift Summit, held Jan. 9, 2018, gave voice to more than 130 diverse media leaders, journalists, educators, survivors and advocates. On Jan. 15, 2019, the Freedom Forum Institute’s Power Shift Project will convene the Power Shift Summit 2.0 at the Newseum to explore what’s changed since the first summit one year ago examined the systems and silence behind sexual misconduct scandals in media organizations. The 2019 summit will gather invited leaders across journalism and the media industry to focus on #MeToo and the media one year later. 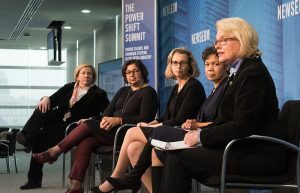 The first Power Shift Summit, held Jan. 9, 2018, gave voice to more than 130 diverse media leaders, journalists, educators, survivors and advocates, which resulted in recommendations and a call for action for meaningful and sustainable culture change. What’s changed and who’s leading the change with promising practices and strategies in newsrooms and media organizations? Where are the untold and under-covered stories about harassment and discrimination across all industries and how do we report them? The latest data and information from the co-chairs of the U.S. Equal Employment Opportunity Commission’s (EEOC) Select Task Force on the Study of Harassment in the Workplace. The summit will feature news industry leaders at the forefront of advocating and creating change, as well as journalists who have covered sexual misconduct stories across the country. Reporters will join with diverse experts and advocates for a session called “The Assignment Desk” with tips and topics for coverage and identifying overlooked and under-covered stories in the workplace and beyond. The summit will also include a conversation with EEOC acting Chair Victoria Lipnic and Commissioner Chai Feldblum, co-chairs of the EEOC’s Select Task Force on the Study of Harassment in the Workplace. They will discuss the latest EEOC data on sexual harassment, as well as the role of leadership, accountability, training and organizational culture change in preventing and stopping harassment. Jill Geisler, Freedom Forum Institute Fellow in Women’s Leadership and Loyola University Chicago’s Bill Plante Chair in Leadership and Media Integrity, will again lead participants in a series of conversations intended to encourage a wide diversity of voices and views. The Power Shift Project’s new “Workplace Integrity” training curriculum was designed by Geisler. The curriculum is built around the three pillars of critical thinking, courageous conversations and creating cultures of respect and trust. The overall goal is workplace integrity — defined as environments free of harassment, discrimination and incivility, but filled with opportunity, especially for those who have historically been under-represented in media’s most powerful roles. The Power Shift Project draws on an advisory board representing a wide group of media organizations, diverse backgrounds and ethnicities, along with experts on legal and other issues. This entry was posted in News and tagged Power Shift Project, Power Shift Summit, Power Shift Summit 2.0 by Freedom Forum Institute. Bookmark the permalink.